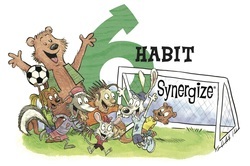 Synergize is when two or more people work together to create a better solution that either would have thought of alone. It’s not your way or my way, but a better way. Talk about the equation: 1 + 1 = 3 (or more). How is that possible? 1 person + another person = 2 ideas + many more than either of them would have thought of alone. 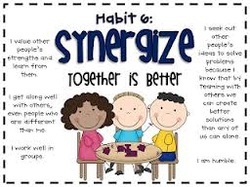 Synergy is taking good ideas and making them better by working together. Discussions can focus on other examples of synergy in nature, history, literature, and personal experiences. For example, synergy happens in nature when a flock of geese heads south for the winter. They fly in a V formation because due to the updraft, the entire flock can fly farther than if each bird flew alone. I value other people’s strengths and learn from them. I get along well with others, even people who are different from me. I work well in groups. I seek out other people’s ideas to solve problems because I know that by teaming with others, we can create better solutions than anyone of us can alone. I am humble.